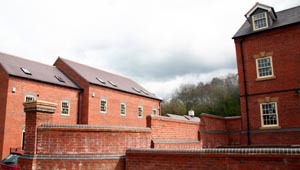 This housing development is adjoining the Jackfield Tile Museum in the Severn Gorge Conservation area and World Heritage site, an area sometimes known as the “birthplace of industry”. It is on a site that was a plain clay tile works. There are records of “Tyle Houses” (kilns) for tile production in the area of Broseley and Jackfield as early as 1545. The clay tile industry continued to flourish here and the highly durable blue roof tiles were regularly traded via the conveniently close River Severn. So successful was this area in producing plain tiles that they became known by the generic term “broseley tiles”. In 1889 numerous local manufacturers established the Broseley Brick and Tile Manufacturers Association which set minimum prices, production levels and wages and organised conserted competition against Welsh slate. Between 1870 and 1930 millions of Broseley tiles were sent accross the UK and beyond. However production in the district never became properly re-established after the Second World War. The large quantities of old tiles littering the under growth on the undeveloped site bears the stamp “ J D & S Broseley” indicating their association membership and the works ownership of John Doughty and Son. Juxtaposition of large industrial buildings and natural landscape are a feature of the Ironbridge Gorge where industrial heritage sits comfortably in a tree lined valley. A planning application for a conventional housing development on this site was turned down. There were footprints on the site of the original industrial buildings and in the Gorge, numerous buildings remain which indicate the scale and the simple brick and plain clay tile on wooden batten design of the local industrial architecture of the ninetenth century. Some of these buildings are home to the industrial museums in the gorge. The local plan dictated a low density development but the later government advice in PPG3 expects development of more than 30 dwelling per hectare. This development contains 17 dwellings on 0.5 hectares but because there are only 6 buildings it provides the impression of low density by retaining many of the trees. This maintains the character of the development in keeping with that of the conservation area and World Heritage site. 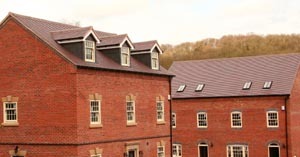 Plain clay tiles, in keeping with the shape and colour of the former production on the site were required. Some old “Broseley” stamped tiles were found in a shaft on the site and these were used to find a suitable match. Tiling was relatively simple and there were no significant issues. Tiling runs were generally long finishing at pointed verges. The style of roof is in keeping with the industrial buildings of the area. The challenge was to find genuine Blue Brindle tiles rather than modern reproductions bearing the name Staffordshire Blue, but which are in fact artificially coloured. The feature of genuine is that they exhibit the same degree of vitrification as Staffordshire Blue Bricks, consequently this blue colour has been regarded by builders as a guarantee of durability. The six buildings represent the master’s grand house, and this contains dormer windows in the roof at the third storey. The terraced workers cottages and large and small industrial style buildings faithfully reproduce the 19th century local fashion of brick and plain roof tile construction of industrial buildings. The old roofs were plain tile laid on wooden battens whilst the new roofs are similar but with the addition of underlay and insulation. 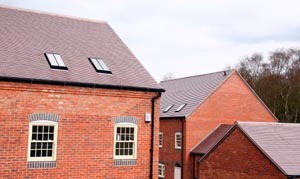 The only modern concession is the use of velux windows to provide light to the top storey acomodation; these cause minimum disruption to the traditionally long unbroken areas of plain clay tile roof. 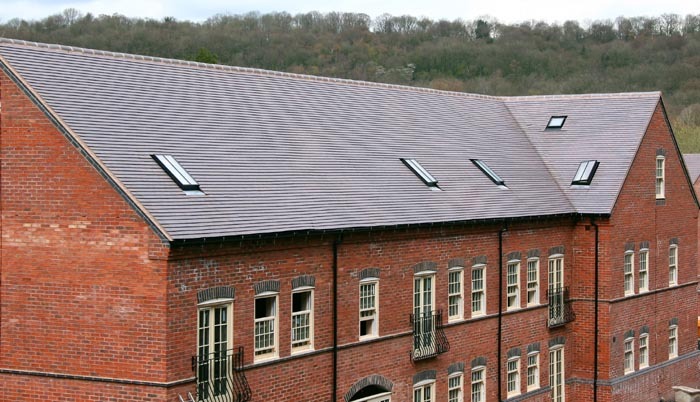 Whilst these are simple roofs, undemanding in terms of tiling detail, they do embody an important part of the history of the clay roofing tile manufacture in the UK on a site that is acknowledged worldwide. Bridgnorth District Council expects clay tiles to be used in conservation areas. Developers Amartey and Yafai provided samples from numerous clay tile manufacturers. It was important that the tiles represented the clay technology of the area and those used on the industrial buildings in the past. 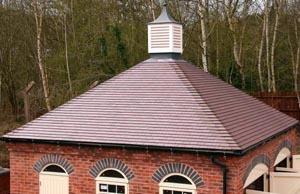 Although there is no longer a tilery in the Broseley area the Dreadnought factory is less than 20 miles away and has always used the same technique of firing tiles on edge, nib apart which enables genuine blue and brindle colours to be obtained in the traditional manner of kiln control without using artificial stains and pigments. Consequently it was the Dreadnought Blue Brindle tiles that the planners insisted upon as they best represent the traditional Broseley tiles of the area that were manufactured over a period of 450 years.